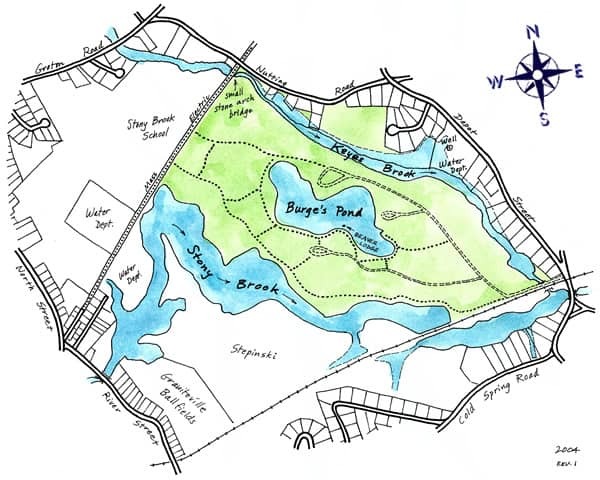 East Boston Camps was purchased by an enthusiastic and unanimous town meeting vote in early 2005. Town meeting changed its name in 2014 to Stony Brook Conservation Land. This 286-acre parcel of land is essentially a peninsula bordered on the west by Stony Brook and on the east by Keyes Brook. In the middle of the land is the clear and lovely Burge’s Pond. Because of these water resources, the land contains extensive and varied wildlife habitats. The land itself is comprised of glacial deposits of sand and gravel in the form of long, high, steep eskers. The brooks are host to many migratory bird species in spring and fall, some of which nest here, such as mergansers, pintails, ring-necked and wood ducks. The woods are full of migratory song birds such as various warbler species, scarlet tanangers, orioles, and thrushes. Many resident birds such as barred, screech and great horned owl nest here too. Wildflowers, both common and uncommon, line the banks of the Stony Brook. Mammals such as red fox, white-tailed deer, mink, otter and fisher pass through. There are a bog and several vernal pools on the property. 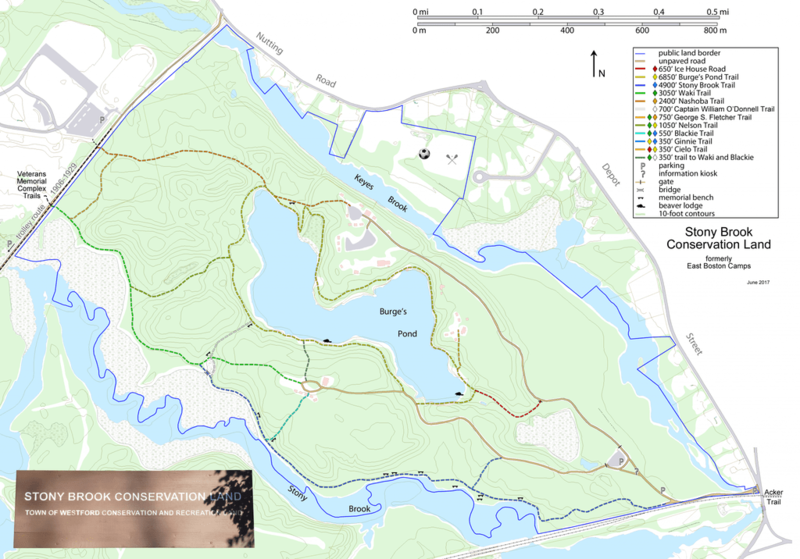 An extensive trail system links these habitat areas with the camp buildings themselves. Except when the camp is in session in July and August, the trails are open to the public for non-motorized uses. During camp season, only the trail along Stony Brook is open to walkers. Between the Stony Brook School and the northwest border of Stony Brook Conservation Land is the Mass Electric Line. This was a trolley line many years ago and has become an attractive, level rail trail. Many children can use it to walk or bicycle to and from school. It begins in Graniteville, passes next to the school, and extends all the way to Nabnasset. In November 2015, the Waki-Nashoba Connector was renamed in honor of George S. Fletcher, caretaker at the camps for over forty years and well loved by previous campers, counselors and town residents. Enter Stony Brook Conservation Land at Depot Street across from the farm stand at the Depot Street bridge near Lowell Road. Drive in along the dirt road and park in the public parking area inside the open metal gate. Take a moment to read the rules and regulations for the property which are posted there. Then, with this map as guide, start your exploration.